Good Monday to everyone. We are already in May and the year is almost halfway over! Isn't that a little crazy. Don't forget our new challenge started this past Sunday! Well today I wanted to share a little card I made. I didn't get a chance to use my bunnies during the Easter rush for cards so I am using them now. 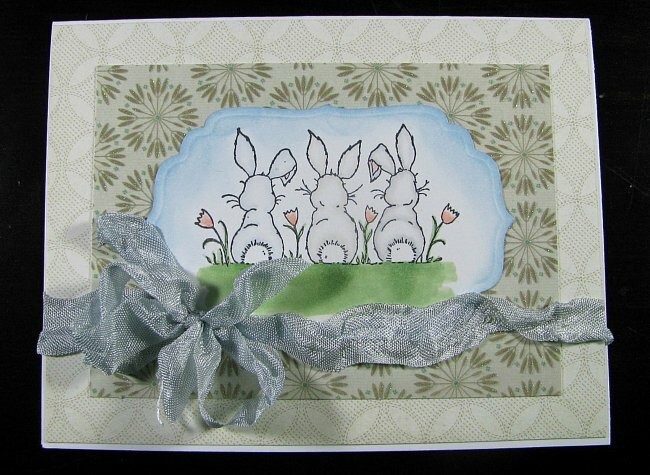 I really wanted a soft card and I accomplished that using Great Impressions Stamp #E749 Bunny Backs. I really did not want to do to much because I didn't want to take away form the image. I used and colored if with copics and then used Bundled Sage distress ink for the grass. I used an older paper pad from Die Cuts With a View and I used a Label 4 spellbinder die. I finished the card off with some crinkle ribbon! Thanks for stopping by and don't forget Jenny will have a wonderful project tomorrow. Very cute! Thats one of my favorite Great Impressions stamps. Sure to make the person who receives it smile. Love how you framed those hunny bunnies to make them really pop Shanna! Such a sweet image...so peaceful! Cute card, Shanna! 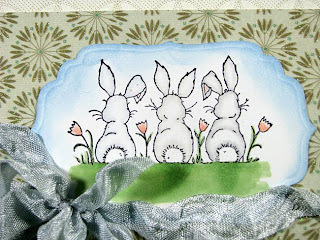 Jen called them hunny bunnies...I was going to say bunny butts LOL...her way is much nicer...super cute!